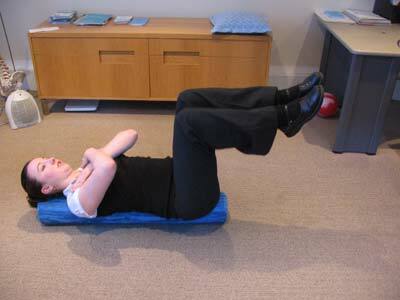 Lie on foam roller so that back, neck and head are supported. Cross arms over chest and ensure that feet are shoulder width apart . Tighten through deep abdominals and slowly lift ___ leg so that knee is in line with hip. Hold___ secs, Perform____ repetitions each side. Assume position on foam roller as above. Raise arms towards ceiling, lift foot away from floor. 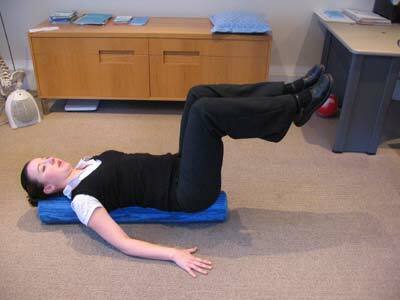 Slowly slide heel away from roller while contracting deep abdominals. Perform ____ repetitions each side. To further challenge yourself, perform task as above while slowly extending opposite arm overhead. Lie on foam roller with head and neck supported. Keep arms on floor, as needed, for added stability. Tighten through deep abdominals and raise both feet away from floor so that knees align with hips. Hold ____ secs, perform ____ repetitions. Lie with neck and head supported on roller. Keeping arms on floor, tighten deep abdominals while lifting legs so that knees are in line with hips. Slowly extend ___ leg, hold ____ secs, perform ____ repetitions each side.